Kid Icarus original NES Nintendo Game cartridge only - Cleaned Tested and Guaranteed to Work! Bonne musique, jeux propre. Je vous le recommande. Game is clean and working great! Playing it with the power glove I got from lukie games! This game is pretty good for being an early NES title. Très bon jeu parmis les meilleurs de la console NES BUT ITS SO HARD ?? Very tough but fun game! Now this is a challenging game! 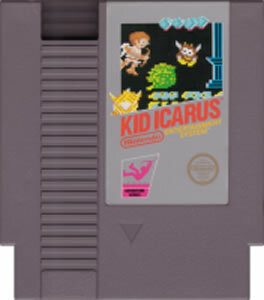 Kid Icarus has it all: great music, great gameplay, and great challenge! It's surprising it has taken Nintendo so long to make a proper new Kid Icarus game. I first played this game courtesy of a friend back in 1994 and later bought myself a copy at a local game exchange. Alas I somehow misplaced it in a move. But it remains one of my favorite NES games. The story is simple. Angel Land was ruled by two goddesses. Palutena, goddess of light, was kind and attentive to her people. Under her auspices te land prospered and the people lived in a virtual paradise. But Medusa, goddess of darkness, envied and hated mortalkind. She brought chaos and disease to the land. Palutena, enraged at the evils done to her people, banished Medusa to the Underworld and for a time there was peace once more. But Medusa soon returned with an army of dark creatures ad overran te Sky Palace. Palutena, in desperation, called upona warrior trainee named Pit, whom she sent to teh Underworld tat he might hone his skills and in so doing earnt he three sacred treasures that would allow him to defeat Medusa. The controls are simple. A jumps, B fires your weapon, the D-pad moves Pit around on the screen. Audio wise he SFX really are nothing special. You ahve the standard firing sound for Pit's weapons, a high pitched and rather annoying sound for when he takes damage damage and various other effects for different situations. Musically is another story. THe music in this game is excellent, from te adventurous themes of the main worlds to the sinister yet still somehow upbeat theme for the fortresses. THe music takes an adventurous turn once more if Pit should manage to win through to the final area of the game. 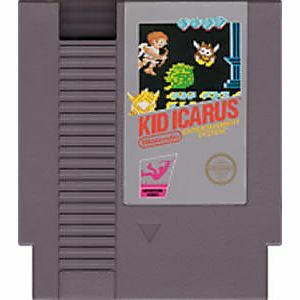 Unlike other games at that time, Kid Icarus also features boss music (in fact I believe it and Metroid were the first games to do so), both for the three Gatekeepers and for the final battle with Medusa. Overall this is an excellent game and one that anyone who owns a NES should have in their collection, as it stands as one of those games that can only be called classics. I do not know things about this game.But the only thing I know about it that it's based on greek things.